This vehicle has entered service at Percy Main Depot on "Cobalt Clipper" service 309 (Newcastle - Blyth) and 310 (Newcastle - North Shields). Ahead of its entry into service, this vehicle has received "Cobalt Clipper" branding. This vehicle, which carries a silver base livery, has arrived into the Go North East fleet. It is currently being prepared for service at Saltmeadows Road Depot. Due to a shortage of storage space at Saltmeadows Road, this vehicle is subject to being stored indoors at the new Gateshead Riverside Depot. 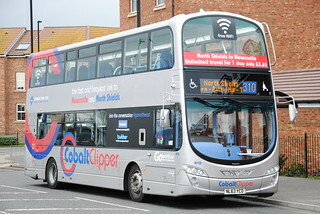 Representing an investment of approximately £3,400,000, Go North East has ordered a batch of seventeen Volvo B9TL/Wright Eclipse Gemini 2 double-deck buses to be launched on the “Cobalt Clipper” 309/310 services at Percy Main Depot. These brand new buses feature Esteban Civic V3 seating; free passenger Wi-Fi; power sockets with USB connections, and ‘Next Stop’ audio-visual announcements. 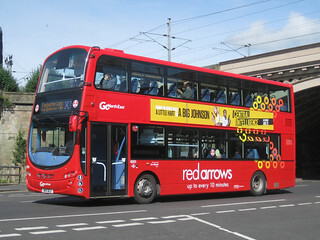 This vehicle has received the revised "Red Arrows" branding. Following the entry into service of the refurbished Mercedes Citaros on "Wear Xpress" service X5, this vehicle has transferred from Deptford Depot to Percy Main. At Percy Main, this vehicle will displace Scania L94UB/Wright Solar 4962 (NL52 WVT) and 4963 (NL52 WVU) to Riverside's Driver Training fleet. 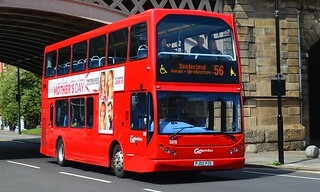 This vehicle, which carries Go North East's corporate livery, has arrived into the Go North East fleet. 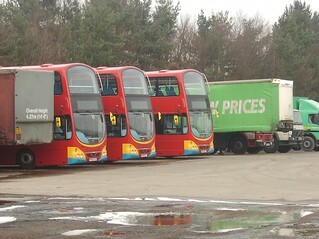 It features high backed 'Civic V3' seating, and is currently being prepared for service at Saltmeadows Road Depot. 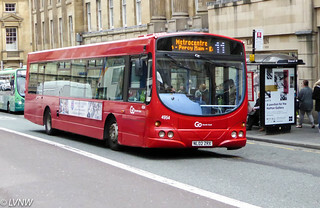 Having previously carried 'Northern' fleet names, this vehicle has been repainted into Go North East's corporate livery.